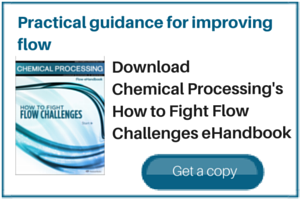 This Chemical Processing eHandbook examines some of today’s Flow challenges for chemical manufacturers and offers solutions that can be implemented to help make your operations run more smoothly . Pick the Proper Valve: Consider a number of factors to match a valve to the application. Ponder Using Press Fittings: Case study shows how press fittings speed installation and can withstand harsh environments and materials.